Antiques challenge. Catherine Southon and Paul Laidlaw kick off the series in Northern Ireland. They start as friends, but there's a bust up before their first auction. With £200 each, a classic car and a goal to scour for antiques. with a couple of swells. Have we got a picnic in the back? Champagne and quails eggs, of course. Oh, you're stylish, you are, Paul! Smell that. Whatever he's doing is essentially farm cutting of grass. Do I buy the brooch? I DO buy the brooch! ..but she's particularly pumped up about this one. Mmmm, I LOVE this stuff. Mr Laidlaw's reputation precedes him. and everybody else will walk past. And then it turns to gold. and dates from a time before seatbelts were mandatory. With £200 each and the sun shining down, let joy be your guide. I think we're going to be happy here. Woo-hoo! We are on our way! before arriving several hundred miles later in Aberdeen. and then make our way south towards an auction in Omagh. A proper seaside resort with three splendid beaches and a harbour. when the railway arrived here back in 1855. -I'm going to come back with armfuls. -Have a good 'un. See you later. Quite a lot by the looks of it. Now, like it says outside, John's shop is very vintage. perhaps reflecting the personality of the proprietor. -You look fabulous in it, John. Flattery aside, maybe that's the way to go. There's a lot of retro and there's a lot of vintage. knowing what people around here want to buy. -Or I could just take a punt. -Can I try it on? -I feel like I could do anything. I just really, really, really want to buy that. I feel like I should be on a children's TV programme. Yikes! But will these things actually sell? -Actually, it's an evening auction that we're going to. -Put a bit of disco music on. I've GOT to have it. John, we are good friends here. I'm enjoying this. Now, what about our other man in tweed elsewhere in Portrush? -Good morning, Paul. Great to have you here. -Great to be here. You're Ernie? My grandfaither was an Ernie. Another Irishman. I wonder what bargains his heritage might bring forth? You happy to do a bit of haggling? Oh, aye, yeah. I've done it before. considering Paul's tastes, could be a good thing. -Why is that open locket sitting on its own? It's going to be a late 19th, maybe early 20th century affair. and how on earth do you get your photograph in there? You just unscrew that little terminal there and we're in. -Two little photographs in there. I think it's rather nice, but there's not a lot of gold in it. I'll come right back at you with 22. -It's inevitable where we end up, isn't it? Surely you're ahead of me here. -Think about that at 25. I'm going to put it there. I did, aye. It's no done yet, but I think we both know it is. Er, to clarify, I think they've come down from 59 to £25. Now, moving on. It's £7.50, that's what it is. Well, we know its date. That's going to date to the '30s, isn't it, with that aesthetic? It's 30 quid's worth, isn't it? -No, we'll split the two. You said I was mean - a quid?! -Aye, but a quid's a quid. Ernie, you know what it is? I think that's the funkiest sugar caster I've ever seen. Strawberries. "Pass me the sugar, darling." - "Oh, yes. What's this?" - "Oh, it's my latest. Have you not seen it? Do press the top, darling." I think that's fantastic, isn't it? £30. Bear with me a second. He looks chuffed. What about Catherine? -This would have been for mashing. -Oh, no, it's not a dolly. -How old is this, by the way? -What is on this anyway? Everything's 25 in your shop. I'm going to go outside and I'm going to rename this shop. It's not Vintage any more, it's "Everything £25". -It's cos I like your smile. It looks like, after a vintage start, she's hedging her bets a bit. This is pokerwork, so we've got a frame. that just looks so dull, doesn't it? What do you think about this? Do people buy this sort of thing? Do they like this here in Northern Ireland? That's a very strange toilet seat. What sort of toilets do you have here in Northern Ireland? -Can I put this to one side, John? What is that? A little brooch with a bird on? -That looks a bit arts and craftsy. -What would you say that is? -Even I know it's a bird. -He's more of a tie man, really. And you're going to ask me how much, aren't you? Well, it's the million dollar question. -We'd really be looking at 20. -That just really jumped out at me. I want to buy another two items from you. That's 25, that's 25 and that is not 25. -18. I'm definitely going to go for this. I'm going to do 25. And I'm done. -And I will still keep my tie. -you could always throw that in. 50... £68, I owe you. -It's been wonderful. Wow, even the notes are different here! That's JB Dunlop, the tyre chap, by the way. moving towards Londonderry, or Derry as it's also known. Derry is one of the finest walled cities in Europe. the huge role the city played during World War II. -It is indeed, Paul. Welcome to the museum. Thanks very much. I am more than delighted to be here. the port on the River Foyle assumed huge strategic importance. but it was the invasion of France that brought the battle here. became a really vital port in defence of those ships. -OK. Was it a big port before then? and quite a small little town in its own right. The war thrust Derry into the limelight. but also for the other Allied forces. all these different voices and nationalities. water wide enough to accommodate up to 130 ships at any one time. showing the sheer scale of the ships lined up alongside one another. walk from ship to ship to ship from one side of the river to the other. became the front line in the battle against the U-boats. and, once again, the port of Derry made the headlines. -because the official surrender of the U-boat is taken here. he comes in person to the city to accept the official surrender. So U-boats sail up the Foyle into the harbour? Allied forces, the Americans, the British and the Canadians. upwards of 60 odd U-boats come into the city and surrendered here. taken from the U-boats and kept as souvenirs. I recognise some but not all of these. Probably is one of our prized items within this collection. but why is there a stock pot or whatever? -We see it as a cooking pot. We think it was used for cooking food onboard. -U1108 struck on the side of it. Is that a U-boat reference? -you and 30-odd of your comrades, this brings it home. our bitter enemies, but they were also brave men. The U-boat crews suffered a frightening death toll of over 82%. -I believe, as "Iron Coffins". They were the enemy, but, again, it's a human story. guys coming off the U-boats as they surrendered here. Catherine's on the lookout for her next shop. -Hello, there. Hi. I'm Catherine. -Hello, Simon. Nice to meet you. You only need to look up to see what this shop specialises in. -I really love your lights. although Simon may take a dim view of your budget. -What's that up there, the "Chemist"? Is it a light? -For putting outside a chemist shop? -Outside a chemist shop, yeah. -I like that. What sort of price have you got on that? is that something that you could do a very good deal on or not? I don't think we're going to be able to meet on that one, no. Fair enough. I shall carry on looking. Never mind. There's lots more. It's got a good ring to it. -I know. It's just not doing it for me. -Well, at least we've moved on from you-know-what. It's got 48 on that. What's the price on that? Can that be very cheap? It looks like it's been here a while. -That's a very old sticker. Do it for 40 quid. -Can you do, like, 20? -35 will be the very best on it. -And what is the price you would put on that? -The gong, I can do for 35. What are people going to be interested in more? I don't know. -Personally, I like the mirror. At an auction I think that will sell. -We find around here gongs sell well. -Best take a closer look at it then. nice plaque at the bottom where you could put a name on. -Do people like having these in the home? when they're trying to get their loved ones down to dinner? I know it's only faux tortoiseshell, but it just feels good. There's a bit of ding in it here. So, it's between a ding and a dong. Can you make it easier for me and come down to 30 on that? I can go down to 30 on that one. I know what I bought that for so I have a bit more room on that. And you think that's going to make some money? I think so. Around here, yes. I came in wanting a light and I leave with a gong. -That's oh, my gong, by the way. Thanks a lot, Simon, bye-bye. My grandfather came from the north. My grandmother came from Donegal, which is just that way. So this place is full of Laidlaws, basically. I've lost already. Don't forget, we still have Scotland to look forward to. Next morning, nobody's letting the weather dampen their spirits. -Why have we never road-tripped before? We're having so much fun. This is madness. Those set her back £98, leaving her just over 100 to spend today. Do press the top, darling. ..meaning he has almost £170 remaining in his wallet. This is our first road trip together and I'm not giving up yet. I'm in it for the battle. I'm going to give it everything. Is it getting hot in this car? but our next stop is Sandholes, County Tyrone. it's Paul's first shop of the day, somewhere. -Hello, there. Is it Stanley? -If you told me this was a museum, I'd pay you an admission fee. You'd never have guessed it standing in the farmyard. Well, can I just have a wee rummage, a wee mooch? You look away to your heart's content. I hope you've brought plenty of money with you. The biggest problem is going to be dragging Paul out of here. This is an antiques maze for me, and how does one crack a maze? Keep turning left and that's what I do. Clockwise, follow the walls. See, see, you thought I was just crazy. And you have your uses. This is a combination rushnip and candle-holder. This is early rustic domestic lighting. The candle that went in here was not a wax candle as you know it. It was a tallow candle, animal fat and so on. Foul things! they gave off a kind of stench you can imagine. soaked or treated in some way, could be clenched in here. Picture a straw. There you go, look. Set in this, just like a wee set of pliers. In it goes. Light it and it will slowly burn down. This is the little object that finishes the look. If I said to you that's £25, you'd go, "Yeah, seems about right." Well, no, no, no, no, no. Never going to happen. and not expensive at that. Love it. but hopefully he'll soon find something nearer his budget. -Give me a bargain price on that then. That was quick. What is it exactly, Paul? A little Victorian gilt tooled burgundy leather case. You open it up and this was expensive in its day, was it not? -A lovely little lady's manicure set. What does one need to tidy one's nails? you buy them with silver handles and that's what they have. And you may also require a little cuticle pusher and a nail file. Yeah, the ticket price was £19. Any other underappreciated gems in here, Paul? These are unusual. Very competently turned shoulder baluster there. to them are the bases, wherein the bark has been preserved. Now, the label says two rosewood candlesticks. That's not rosewood. That's olivewood. or the Holy Lands, as they'd have been referred to. I can prove that because there are little marks there. late Victorian traveller who visited Jerusalem. The ticket price on those is £18. -You're not going to sell them quickly. I think they're hard work, but you've got me. £10. You couldn't get much cheaper than that. I'd be daft not to take a punt on that. You've done it. -I'll settle my debts. It's an easy £20. and grab my goodies as I go. to learn about the Ulster roots of an American millionaire. -Hi, there. Very nice to meet you. ..and the home of Thomas Mellon. dedicated to the story of Irish emigration. powerful industrial nation on earth. Thomas was born here in 1813. He lived here with his father, Andrew, and mother, Rebecca. They were kind of well settled here on their 23 acres. So what was the main reason for leaving? "Things are very good here. Why don't you join us?" they make a living here or would the opportunities be better in America? Young Thomas was just five when their long journey began. and they docked about three months later at Baltimore. -This is amazing, isn't it? where Thomas' grandfather had arrived two years before. until they could acquire land of their own, which they did. the type of building then that they would have lived in for a few years. Thomas works very hard on this farm right from an early age. he walks 20 miles into Pittsburgh on an errand for them. "Look at this grand houses. "There's no reason why I couldn't have something like that as well." whilst always investing his wages wisely. "Well, you know, there's nothing really much to this. "Why don't I try my hand at this?" Thomas started in January 1870.
after the Civil War soon began to pay dividends. not only Thomas, his two sons, and they had their finger in every pie. he is such a family man. He is devoted to his children. New York and nurtured many of the household names of the 20th century. It leaves them with one task. one of the sons Andrew is involved in all sorts of enterprises. They end up in General Motors. They end up financing Heinz. It's a tremendous incredible story. They're up there with the Rockefellers. And so does ours, but on a slightly more modest scale. known to locals as THE Moy. -You got much to buy? -I'm buying all that. I'm buying the lot. Shared shops can be a bit of a trial, of course. Try to avoid each other's toes, eh? Looks like Paul's already noticed something. Cagey! But, with this much room, what could possibly go wrong? There is one thing I have seen and it happens to be in this cabinet. Does it have a doggy theme? Would you please remove yourself from this cabinet? -What is it? What have you seen? and the christening spoon in the case at £12? I've already had a look at it. It's bagsied. I'm not playing any more. -Is the expression "first dibs"? Well, we did see him spot them. I want that. I saw that and I really wanted that. Will Catherine graciously accept defeat? Right, I'm going to sulk. I thought you were my friend, Paul. -What? What do you want me to do? -No, go on, have it. No! No! It'll be jinxed now. That is the one thing I wanted to have. -The honeymoon's not even started. -No, it's divorce already. I'm sorry. -Well, I want the dog. I feel a bit defeated now. Deflated as well. Can't believe that he bought that under my nose. Looks like our gentleman's not having any second thoughts then. -Not too bad, Paul. How are you? ..but a hard man like myself is looking for a discount, of course. Let me see. 24. Say three at £8. £16 for the two, same price? No clowning about with you or I, is there? Wonderful. Now, where's Catherine off to? -Can I buy your donkey? you have to take me along with it. -That's all right. I don't mind. It would certainly stand out at an auction. Lovely. Of course, they did used to have a horse fair here. Ooh, my goodness, we don't get these in London! Meanwhile, Paul has monkey business. how about, as an antidote, the monkey that got the apple? Aye, it's a wee belter, I don't mind telling you. English, mid-20th century. Late '30s-1940s. It does have a back stamp which I cannot read. -I think that is just a lovely little model. and I think you're not looking at a monkey. You're looking at a peace offering from me to Catherine. -You've got to do some serious schmoozing. -A monkey's not going to do it, my friend. I think that's a wee belter. It's 15 quid if you want it. You buy it and I'll have the spoon. You buy that and I'll have the spoon. Remind me never to play poker with you. You're all want. Worth a try. Maybe flowers would have been more appropriate. -Catherine doesn't want my poor wee monkey. -He's a good guy, this. -He's all right, isn't he? -Yeah, he's different, isn't he? Well, he's different and he's coming home with me. This really could end in tears. Ah, now Catherine's grabbed Dermot. Prepare for some arm-twisting. There's a plate here. Can you tell me anything about this? It probably came from a house clearance, you know. -Part of a job lot. -It's got a massive crack, hasn't it? It's quite interesting, quite decorative, isn't it? -What price is on that? -It's a more substantial item. It's bigger, that's the thing. -You wouldn't do it for 10 or something? -I'll let it go at 15. -OK, I'll think about that one. -That didn't quite do it. Now, Dermot's had a rummage in his special cupboard. They were known as Irish Eights, cos they're in the shape of an eight. Where's the key number? There it is. Matching numbers, so they still work. They're great, aren't they? So these are Irish? but only used in Ireland by the RIC, which was the Irish police. -What are you asking for? Please be kind to me. I've had a BAD afternoon with that ladle. Online, these would make 120 quid. Now, for you, I'll take the money back. -Sounds like a good price. -Can I give you a bit less than that? -What were you thinking of? Ideally, honestly, I would like about 30. What could you do? 40 quid. I'm taking a loss of a tenner on it. You're a star. I think I've got a chance with those. Take a chance. Those will make money. let's have a look at what they've got. and, of course, a monkey figurine. some handcuffs and that very colourful suit. Don't get me started on the costume, OK. It's fancy dress. so we're best not to mention the spoon. which I have now identified as early Beswick and rather rare. and I'm going to really regret not taking it off him. If it doesn't make a profit, the joke's on me, but I think it will. auction closer to the border, in Omagh. I'm just so happy to be here. I think it's wonderful and I do like the idea of an evening auction. hopefully for my items and not yours. -It's a tonic. You know what you are? You're a tonic. although monkeys are, of course, rare. Welcome to the world of Irish auctions, Catherine. Good luck, my friend, good luck. You say that with menace! I wonder what auctioneer Geoffrey Simpson thinks will fly. so it should go well. The Beswick monkey should make £45-50. and somebody will like it for the novelty value. The picture frame, I think is Belfast Arts and Crafts. A little bit more attractive than the average pokerwork. As it is an unusual piece, I would see it making, you know, £45-50. Crikey, where did they all come from? -This is good. I've got a good feeling. She did, indeed. Let's see what they make of Paul's candlesticks. -There's a twitching going on here. There's a nervous twitch. £50. 40. 30. 20. 10. Starting at a fiver. Fiver bid. At five, at five, at five. Anybody going to give me seven? £7. £9 down the back. At nine. -At 11. At 11, at 11. At 11. 13. 13, gentleman in the middle. At 13. At 13. 15 to the lady. Is everybody happy at £15? -Not ecstatic, but better than nought. I'm happy. Calling all fine diners, it's Catherine's first lot. -Wait a minute. This is your lot. At £30. Any advance on 30? I'm going to sell at £35 if we can't get more money. -At £35. 40. At 40. And again at 40. At 40, at 40, at 40, at £40. At £40 it is once. £40 it is twice. Is everybody happy at £40? This bodes well. One profit each. Oi-oi, it's the monkey. Was Catherine right to reject him? You stared a gift horse in the mouth. You didn't give it to me properly. If you... I was cross. It has a printed and impressed marque. who's going to give me £75 to start the bidding? £30 bid. At £30. At 30. At 35. £40 at the back on the phone. I'm going to sell it at £40 if I can't get more money. At £40, it is once. At £40 twice. All finished and done at... New blood. At 45. At 45. At 45 here at the front. At 45 once. Twice. All finished, all done at 45. Lady at the front at 45. It's hotting up. I can feel it. How will Catherine's arresting purchase fair? -Who's going to give me £100? 75. Start me at 50. £50 bid. At £50. Any advance on 50? At £50. £60 on my right. Did he say 70? You wish you'd have bought these, don't you? All finished, all done at £70. You got them at 70. That'll ease the monkey regrets. I knew I loved Northern Ireland. This is great. Who's going to give me £50? 40. 30. 20. £20 bid. At £20. 25 over here. £30 in the back. At £30. At 30, at 30, at 30. 35 in the middle. £35. At 35. -At 40. At 40, at 40, at 40. At £40 it is. 45. New blood. God bless you. Come again. At 50 down here. At £50. Any advance on 50? All finished, all done at £50. Lady at the front at 50. I mean they were nice. They weren't that nice. Never mind nice, they were spectacular. Catherine's pokerwork frame. No losses yet. The most stylish object in tonight's sale. Did he say it was the most stylish object in the sale? That's what I said about it. I rate this rather highly as an object. At £40. At 40, at 40, at 40. Straight in, no? He thinks 200. 45. 50 on the phone. At 50 on the phone. On the phone? Did he say on the phone? 55 seated. At 55 seated. Any advance on 55? 55. At 55. At 60, new blood. They are queueing up to buy the mirror. They've all come tonight to buy the mirror. almost ecstasy on the faces of our celebrities. All finished and done at £60? Lady's bid on my extreme right at £60. This is a very nice auction indeed. Time for Paul's controversial spoons and his caster. Start me at £50. 40. 30. £30 bid. At the very back at £30. Straight in, come on, keep it going. 30. At 35. At 35 with me. £40. Any advance on 40? Who's going to give me 45? -I never liked that spoon anyway. -You like it a lot less now. At £40 it is twice. All finished, all done at £40. Will the profits never cease? Catherine's bird brooch is next. Start me off at £20. 15. 10 anywhere to begin the bidding. £10 bid down here. At £10 in the middle there. At £10 and I'm going to sell it. At £10 if we can't get more money. All finished, all done at the back there at £10. £10 more than it's worth. Don't listen to him, Catherine. Paul's locket is up now. Start me off at £100. £70. 40. £40 bid. At 40, at 40, at 40. At 50. At £50. All finished, all done at £50. That's £50. Doubled up. Just one lot to go. My work here is done. Good luck with fancy dress. Now that is rude. I'm rooting for you, Catherine. A vintage, retro 1970s jacket. That's the way to sell it, Bridget. The star of the show, Bridget. It actually fit really well. -At 30 by a gentleman. 50 back there. At 50. At 50. At 60 at the back. At £60. At £60, it is once. £60, it is twice. All finished and done at £60. Well done, sir. She certainly did. Another mighty profit. Well, I don't know about you but I am ready for my bed. -Are we going to get our slippers? That really was auction night fever. and made, after paying auction costs, a profit of £58.80. he's produced a profit of £82 and a slim lead. -Now, the lights might be an issue. Woo-hoo! We are out of here. Are you ready for this? Are you ready? 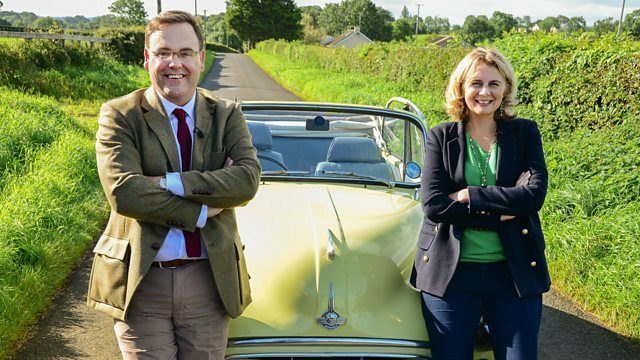 Antique hunters Catherine Southon and Paul Laidlaw kick off a new series in Northern Ireland. They start as friends, but there's a bust up before their first auction of the week at Omagh, County Tyrone.